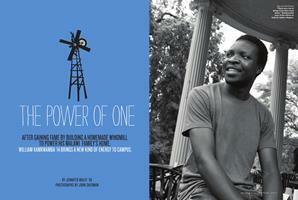 William Kamkwamba ’14 brings a new kind of energy to campus. 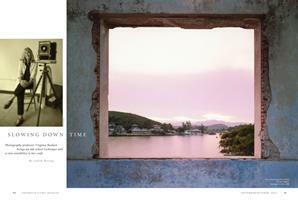 Photography professor Virginia Beahan brings an old-school technique and a rare sensibility to her craft. 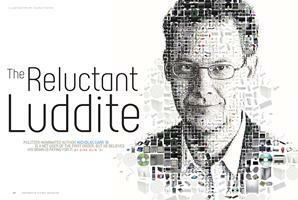 Pulitzer-nominated author Nicholas Carr ’81 is a net user of the first order. But he believes his brain is paying for it. Decades ago, thanks to a clever alum and a popular showman, a bizarre collection of oddities arrived at the College museum. The only thing stranger than the relics is the curious tale of how they got here. A recent grad who drank little as a student explains why the administration alone will never change the College’s drinking culture. The WNBA’s new president is intent on expanding the league’s fanbase—and thinks she has the players to do it. In 1961 the civil rights movement arrived at a critical juncture in Jackson, Mississippi. James Breeden ’56 was there. The old tale of a compact with Satan forges a compact of friendship—and promises kept. When the 1992 heavyweights reunited to prep for last year’s Head of the Charles, it was just like old times. Sort of. Students in a public-policy sociology course who think they can end poverty face a more pessimistic reality. Was it a requirement that the faculty in 1886 sport beards and look stern for the camera? New dean of the College Charlotte Johnson brings her unique blend of legal and academic experience to Hanover. The country wouldn’t be possible if not for the role played by the many women and men who did not conform to conventional gender expectations.